Lear is back folks! Well almost back. They're about to re-emerge from bankruptcy, after wiping out holders of the previous class of common stock. Barclays is out this morning upgrading what I'll assume are the "new" shares. They're probably making a good call -->>now that management owns enough of the new shares to actually care about the equity holders in this new "structure." I put this info out there not because I enjoy ranting about inept management, but rather as a warning to people who assume common stock ownership is (1) as safe as you think it is, and (2) that management is on your side all the time. Here's a presentation Lear gave back in April. I love the gem in there, "The Company recognizes that it needs to address its debt structure." 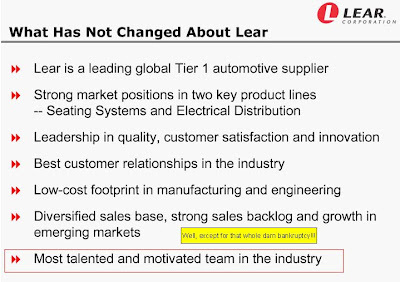 For those who've not followed the story, Lear was hit with the perfect storm of high debt, a crumbling auto industry, and a high fixed cost structure. Earlier this year it became apparent they would need to take drastic actions in order to fulfil debt maturities and plug the holes in their cash-losing operations. Writing about it back then, I spoke to the company and asked if they might consider some "SYA financing," like Alcoa had done. By that I mean "save your a$$" sales of common stock. Yes, it's at low prices and would dilute the hell out of existing shareholders, but at least said shareholders - THE OWNERS OF THE COMPANY -would live another day. 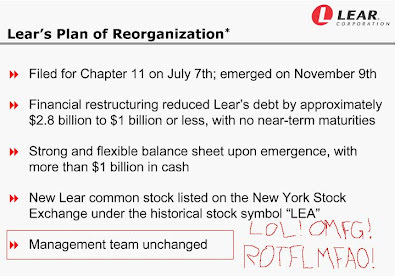 AlphaNinja - C'mon Lear, respect the shareholders. Put a major turnaround plan together, and sell some common stock. With your stock trading at 1.42, the market sees little chance for a turnaround. With additional cash raised from a stock offering, the market may increase your odds of a turnaround, and bring the stock up into the high single digits. 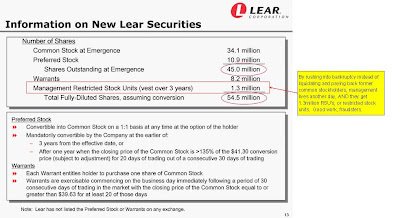 I just got off the phone with Lear's investor relations. After suggesting that the company take actions similar to what Alcoa did, the response was "not at this stock price." Fair enough argument, no one likes to sell low and buy high. So when I ask about how shareholder-friendly the management plans to be in a potential turnaround/restructuring, the reply was (approximately) "the management and board's first responsibility is to the shareholder. But when we get in a potentially bad situation, our lawyers tell us that we have to take steps to protect the whole enterprise value, including debt holders and employees." Now this is what's frustrating -when does the board and management decide that the line has been crossed, and that they now have to let shareholders get stiffed in order to protect other stakeholders. It is a very worrisome scenario to me - how can one feel comfortable investing money in common stock when their interest in tough times is subject to board and company management, who might prefer to hang onto their jobs and give debt holders control of the company, instead of taking drastic actions(liquidation) that would preserve/salvage shareholder value? They did exactly as I suggested they would, a veritable waltz into bankruptcy. While I never was excited about the potential job losses in a liquidation, I was enraged by this company's total lack of concern for the common stockholder. Their actions bordered on criminal. And finally, with an amazing amount of unintentional comedy, they call themselves the most "talented" management in the industry. First off, this industry (at least lately) certainly isn't known for management excellence, so I'm not sure what kinda bar they're setting. More importantly, you're DAMN right they're motivated! They destroyed the previous common stock, cozied up to debt holders, and now have lucrative stock incentive to "motivate" themselves. Too bad they weren't motivated before.